In colonial times, chickens were raised mainly for their eggs, which were prized for baking. 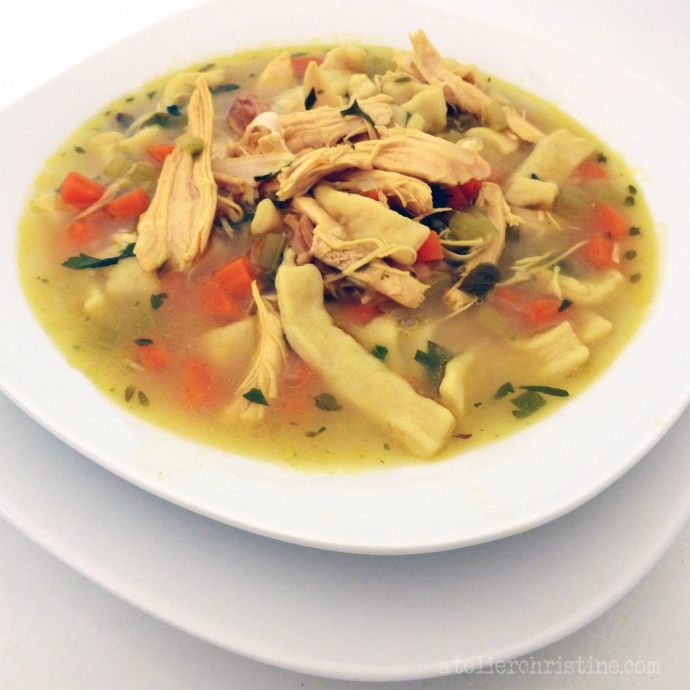 Older chickens that no longer produced eggs were then used in stews and soups like this one. These chickens normally were fattier than younger hens, and colonial housewives used this to their advantage by rendering the fat to use as a flavorful alternative to butter or lard in other dishes. 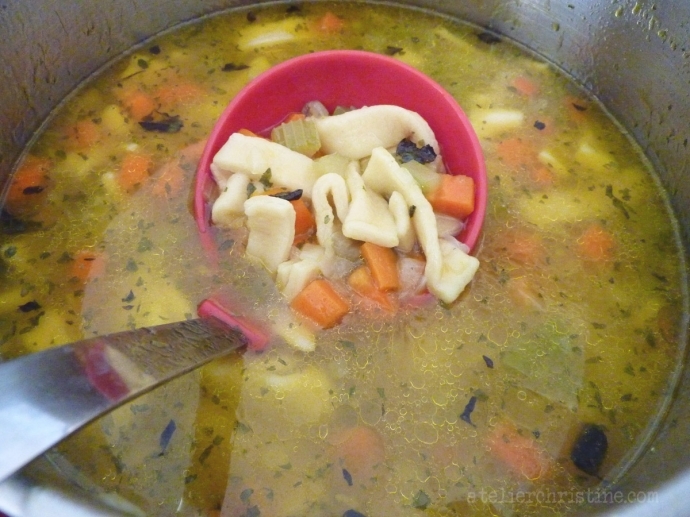 Adding egg noodles, a traditional German preparation, lent texture to the soup and served as a means of transforming the soup into a more hearty meal that could feed an entire family (source: atasteofhistory.org). Start with a batch of homestyle egg noodles made from scratch; a very quick and easy recipe using a food processor. 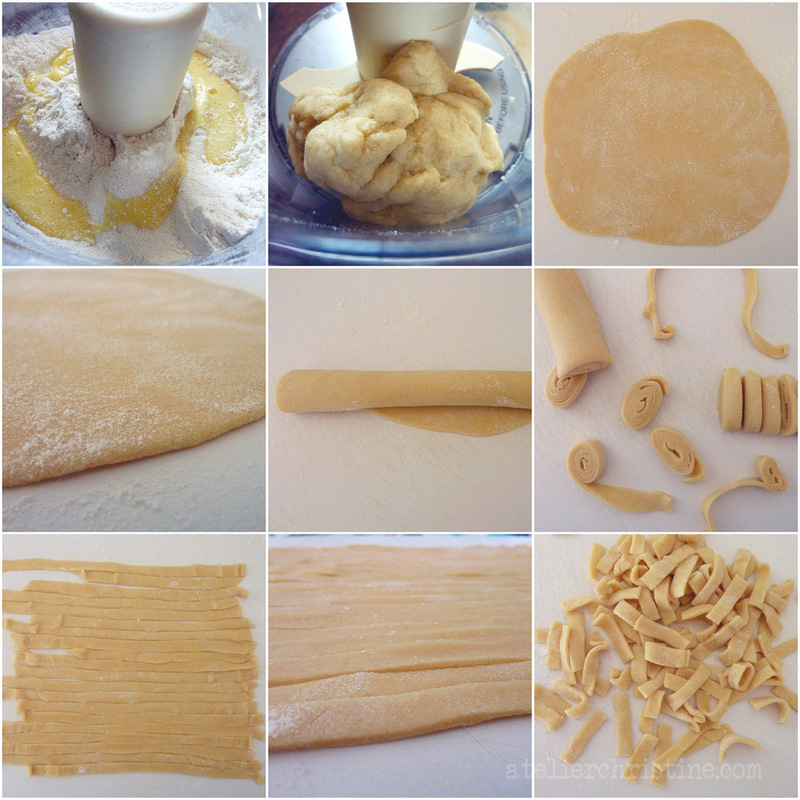 Once you roll out the noodle dough it is then cut into ribbons. 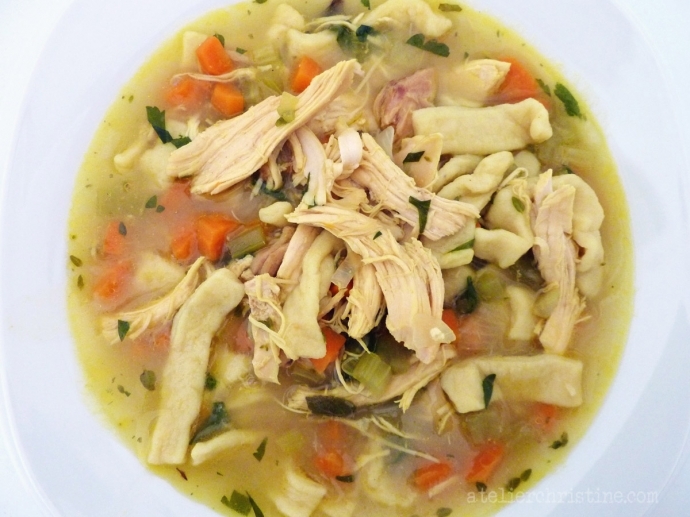 The soup base consists of chicken, celery, carrots, onions and flavors that turn this hearty soup into a one-dish meal; and kid-friendly food may I add. Prepare dough. In a food processor, using the dough blade, combine flours and salt. Pulse in olive oil. With the motor running on low, add in egg or two yolks. Drizzle in enough water until a medium firm dough is obtained. Cover and set aside 20 minutes. Prepare noodles. Divide dough into two if you have a small working space. Roll dough 1/8” thick, lightly and evenly dust with flour and roll jelly-roll style. Trim ends and cut into ribbons about 1/4″ wide. Unroll and cut ribbons into 2” pieces. Repeat with the rest and set aside until ready to use. Prepare chicken. 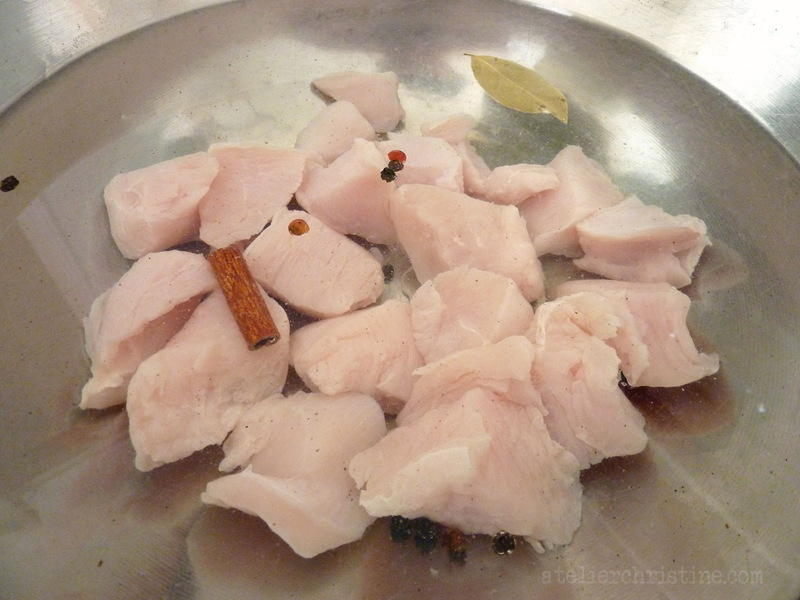 Add chicken into a pot of cold water with a few peppercorns, bay leaf, cardamom and cinnamon stick. Bring to a boil on medium-high heat and cook 3-to-5 minutes. Discard liquid and everything but chicken pieces and set aside. You can shred chicken into smaller pieces if you like. Prepare soup. 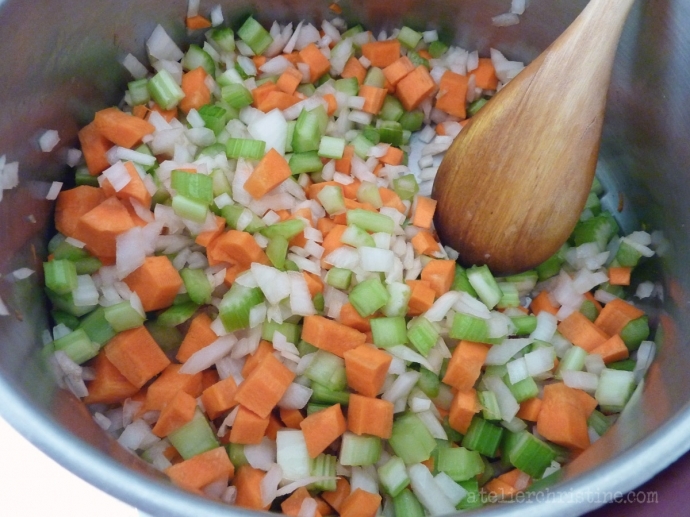 Into a pot add carrots, celery, onion, sunflower oil, sugar and turmeric. Sauté until vegetables are translucent. Add chicken and sauté for a few minutes more. Add water and chicken paste to pot. Bring to a boil, reduce heat to medium-low and cook 10 minutes. Add prepared noodles to pot as you stir, in batches, and keep mixing gently for two minutes to prevent them from sticking together. Bring to a boil once more, reduce heat to medium-low and cook uncovered for about 7 minutes. Add thyme and parsley, cover, and continue cooking on low for another 5-to-10 minutes until noodles are done. Remove from heat, season with white pepper and salt if needed.